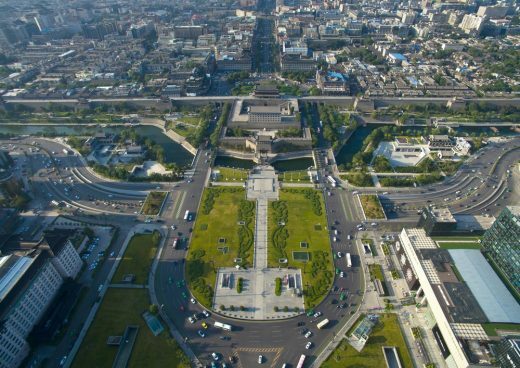 Xi’an South Gate Plaza is located in the middle of the medial axis of Xi’an, which starts from Zhangjiapu Square in the north and ends at the TV tower in the south, crossing The Bell Tower. 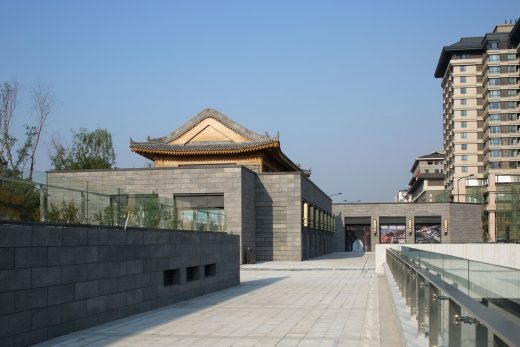 This axes strings together numerous cultural relics of Han, Tang, Ming, Qing dynasties and contemporary age. 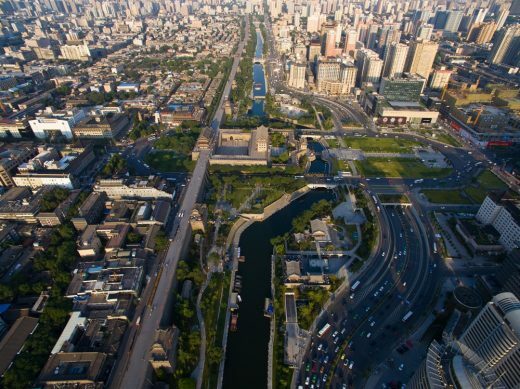 It is also the core area and important node of Xi’an culture, tourism, commerce and transportation. In recent years, with the social progress and economic development, the South Gate Plaza area has gradually exposed a series of problems: the disorder of traffic organization, the inferior quality of square environment, the weak accessibility from outside the plaza, the chaos styles of surrounding landmarks build in different ages. The project is designed in order to supplement and improve the South Gate scenic service facilities, integrate the South Gate Plaza landscape system, use green to confine space, reasonably organize the ground and underground streamlines including vehicle, pedestrian and rail transit across this region. 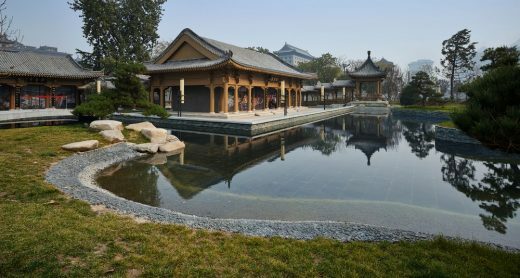 Meanwhile, this vision is under the premise of protecting existing cultural relics resources, enhancing the regional environmental quality and remodeling the historical style of the ancient building. 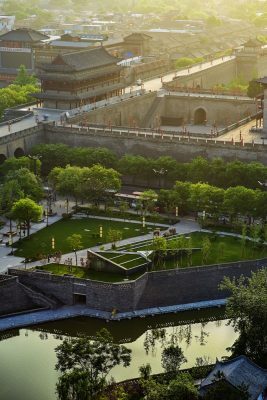 Using the space transition and restriction of Okimichi, drawbridge and green within the principle of limited developing and utilization, the outer plaza of South Gate design captures the iconic gesture of Xi’an South Gate. The underground space is mainly composed by parking lot and tourism service installations which can solve the problem of lack of regional parking spaces and avoid the subway station, city moat and urban rapid channel at the same time. 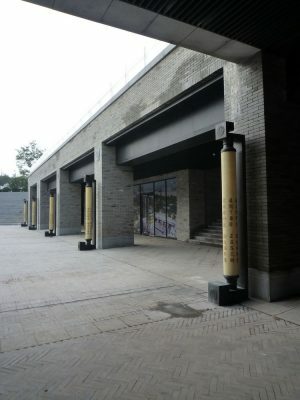 Besides, building a east-west underground pedestrian channel across the plaza connects the Song Garden entrance plaza, the South Gate central plaza and Miao Garden entrance square, successfully separate the pedestrians flow and vehicle traffic to achieve a gorgeous three-dimensional interoperability. 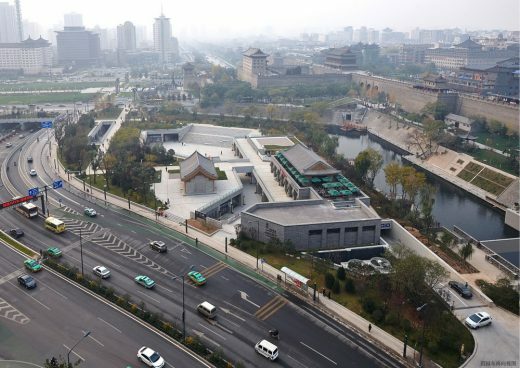 We renovate and remove some temporary buildings which affect the views on the east and west sides of the Huancheng South Road, the former Song Garden and Miao Garden. Underground parking lot served as the South Gate traffic node transfer system and supporting commercial facilities. 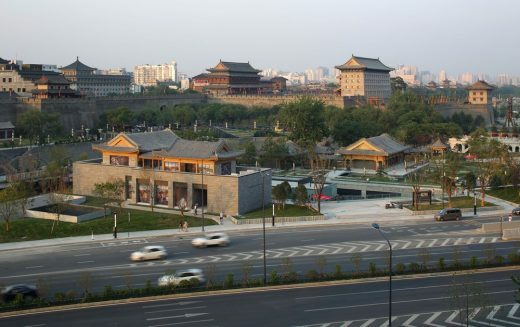 In the vicinity of the South Gate Plaza, we set series of street culture squares, functioned as an important supplement to the South Gate landscape. The Song Garden plot: We retain the original antique-style buildings; organize new constructions in the form of setback to echo the existing surroundings. The terrestrial landscape coordinate with the preserved traditional architectural figure ground. Also, by restoration and renovation of pool with night lighting and elevation variation, we set free underground space as greening effectively. Basement one floor is mainly formed by management and commercial service space, basement two is mostly functionedas equipment space and underground parking lots. Meanwhile, underground buildings set up a rich spatial network using series of sunken courtyards and streets. 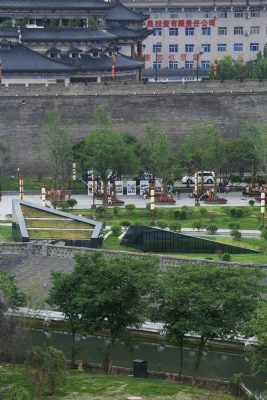 The Miao Garden plot: The sunken central square connects the whole base; ground buildings locate in the northeast corner of the site in the shape of setback, forming a space limit for the city gate. Landscape design relies on the rich height difference terrain, combined with the flow of water artistries, to achieve a multi-layered green system and thus create a people-oriented, transformational landscape. In this plot, basement one is primarily functioned with commercial service space, basement two is mostly composed by equipment space and underground parking lots, supplemented by a small number of commercial service facilities. Close to the south city wall on both sides, the demolition of the original Huancheng Park management office and other chaotic temporary buildings make room for our further design. 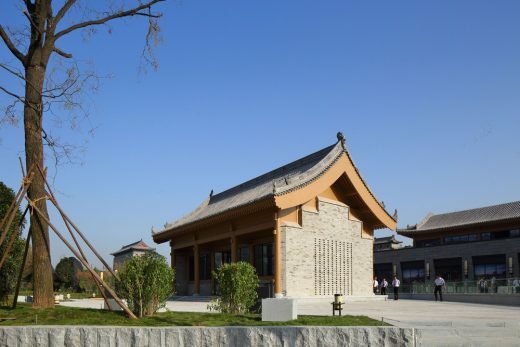 We set pair of glass curtain wall service facilities under the principle of minimalism, nestled in the woods, to meet the functional needs without affecting the overall appearance of ancient city wall. South Gate block: We extend original pedestrian tunnel from the South Main Street to the inner plaza of the South Gate. Through this technique, we try to guide the pedestrian into the South Gate area in order to achieve a three-dimensional separation of people and vehicle flow. Along the channel, we layout public toilets, equipment spaces, housing management rooms and other supporting space. 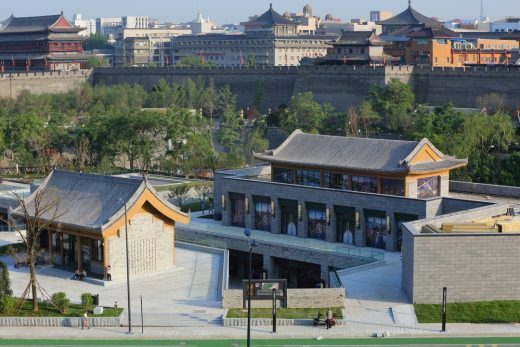 After the reconstruction, the South Gate Plaza, relying on the city wall, highlights the profound cultural connotation of Xi’an, harmonious atmosphere with humanity and nature. 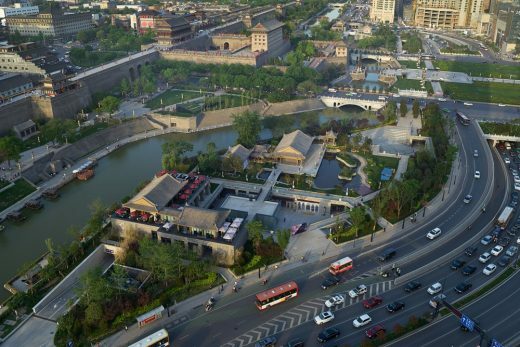 The South Gate Plaza has become an important carrier for the comprehensive development of modern city, as the living room of the ancient capital city–Xi’an. 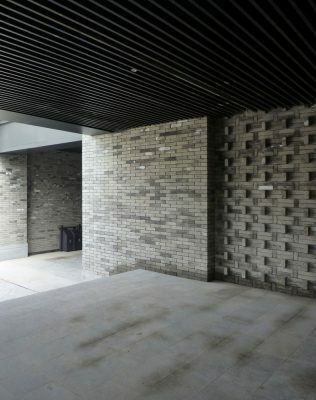 Design company: China northwest architecture design and research institute Co., Ltd.
Landscape design: Zhao Yuanchao, Hu Jie, Zhi Pu, Pan Furong, Jiang Chao, Pan Qian Lighting design: Beijing Lighting Dream City Cultural Development Co., Ltd.